Sir Thrift A lot: Fill'ER Up Coin Bank from Fred! So the deal is, you buy it empty & you slowly fill it up with your spare change as the gauge slowly moves from empty to full. 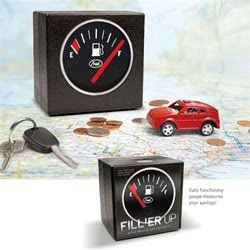 It's a fun way to save up your spare change to later fuel the economy. When it's full, why not take the change to Sally Anne's or Goodwill & buy yourself a fab new sweater? Or a rad coffee cup? Or some vintage stationary? I highly doubt that you're going to lucky enough to come across one in the thrifts, it's possible, but again, I doubt it. If you're digging it race on over to Pop Deluxe & you can pick one up for yourself for $15.99, heck, pick up 2! Buy one for your friend, sister, kids. See who can fill it up faster. Again, you can pick one up right here!